German dumpling stuffed with sweet onion, cabbage, grass fed beef, and horseradish crème fraiche. Chef’s choice of Artisan cheeses and seasonal fruit. House corned beef brisket with saurerkraut, blue cheese remoulade, cornichons and Swiss cheese on marble rye bread. House made salted caramel creme brulee. For Parties of Six or moreone check will be presented that can be equally split up to 6 ways. 18% Gratuity is applied! Name your spirit Vodka, Gin, Tequila, Rum, Or Whisky… and we decide your drink… CHEERS! 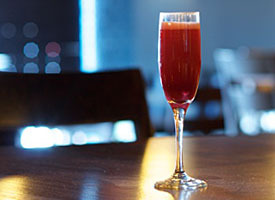 Reposado Tequila, Campari, and Blood Orange Soda… in a drink that unites the bitter and the sweet! St. Germain, Rhubarb Bitters, “Tinny Bubbles,” and an orange twist! “Old Tom Gin”, Mezcal, or Rye stirred with Amaro Nonino, Sweet Vermouth, Peychaud’s Bitters. Gin shaken with fresh thyme, lemon, and topped with soda! Try this with your favorite liquor!!! Fresh lime juice, local mint, rum and soda! Vodka, Bundaberg Ginger Beer, Fresh Lime Juice, served in a Copper Cup! England’s version of the “Long Island,” has been a staple at Wimbledon for decades! Pimm’s No.1, fresh lemon, cucumber, shaken and topped with soda! Muddled lemon, lime, and orange wedges combined with gin and our house red wine, then topped with a citrus soda! The “Washington Apple,” Spiced up with some cinnamon infused whiskey! Tequila, shaken with lime, pineapple, jalapeno, agave nectar, and bitters. Served on a large cube! Classic rum cocktail, for a historical “Character!” Fresh lime and grapefruit with a kiss of agave nectar and bitters! Vodka, gin, or tequila shaken with Aperol & Bitters, served up with a twist of cucumber! 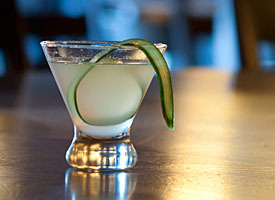 Rangpur Gin, fresh lime, cucumber bring a new twist to the French ’75…Served up! Featuring Makers Mark Bourbon, St. Germain, fresh lemon and a splash of bubbles! Vanilla Vodka, Godiva Dark Chocolate, and Chilled Espresso or Pumpkin Spiced Coffee… Frappa delicious!! !